Ram is one of the founders of StrikeForce Technologies and the inventor of the company’s ProtectID® product. Ram has several years’ experience in security systems and telecommunications. His prior job was at Coreon, where he developed OSS systems for DSL carriers. 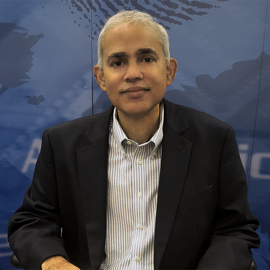 Ram was the founder and chief engineer of Digitech Telecommunications, a network security systems company that manufactured data encryptors (certified by NSA), callback systems, and access control and voice scramblers. He was employed at Computer Sciences Corporation, Synergy Systems, Bellcore and Bell Labs amongst other technology companies, typically as a chief architect or systems engineer. Ram has an MSEE from Rutgers University and a BE in electrical engineering from Stevens Tech. He holds several patents in computer security.